Yesterday, the weather in Northern Virginia finally started to show signs of spring…finally. It was absolutely beautiful! Temperatures were in the mid-60s, sunny, and not a cloud in the sky. Hello Spring! What do we do in the mid-Atlantic when the weather is divine? We drink wine! As I’ve mentioned in some of my previous posts, Virginia actually has a robust and growing wine country. This was something I learned only after I moved up here almost three years ago. It was definitely a little hidden gem that I welcomed with open arms and excitement. I was fortunate enough to be chosen to participate on a tasting panel at one of the Loudoun County wineries, Breaux Vineyards. The Virginia Wine Council, or some organization like that, sanctioned this panel. They were awarded a grant from the state for something that wasn’t exactly clear to me, so this organization created a panel of tasters to try different varieties of Viognier, as well as other wines, with the intent of finding out what people really enjoy. Apparently, the grant had something to do with growing Viognier, which happens to be the official state grape of Virginia. While I am not a regular white wine drinker, I was happy to participate on the panel and give my opinion of the quality of several types of wines. There were a few that I definitely enjoyed more than others, probably the more expensive ones, naturally. I love being critical of wines. My inner aristocrat comes out to play. After the panel, my girlfriend and I decided to do the regular tasting at Breaux, which was voted Virginia’s favorite winery 2008-2011. I’m not sure why, to be honest. I’ve enjoyed some of the other wineries that I’ve visited much more than this one. I found it to be too crowded and impersonal. The wines were not up to par with some of the other wineries around the area such as: Paradise Springs, Desert Rose, Cobbler Mountain, or Philip Carter. We left slightly disappointed in the selection, but not without drinking a glass of the one red wine we did like, which was a Cab Franc called Marquis de Lafayette (2010). After we left Breaux, we decided to make a stop at one more winery while we were north of Purcellville. We stumbled upon Hillsborough Vineyards, which was a deep breath of fresh air. You must visit this beautiful little boutique winery. It was definitely more my speed. While at Hillsborough, you feel like you are in someone’s little cottage with all the wine you could ever want. The stone building, surrounded by gardens and vineyards, is up on a hill with a gorgeous view of the surrounding Blue Ridge Mountains. Out on the back patio where we enjoyed a glass of the Ruby, there was a delicious smelling fire in the pit. Not only did the place feel like the mountains, but it smelled like them too. We were worlds away from the hustle and bustle of Breaux just down the street. 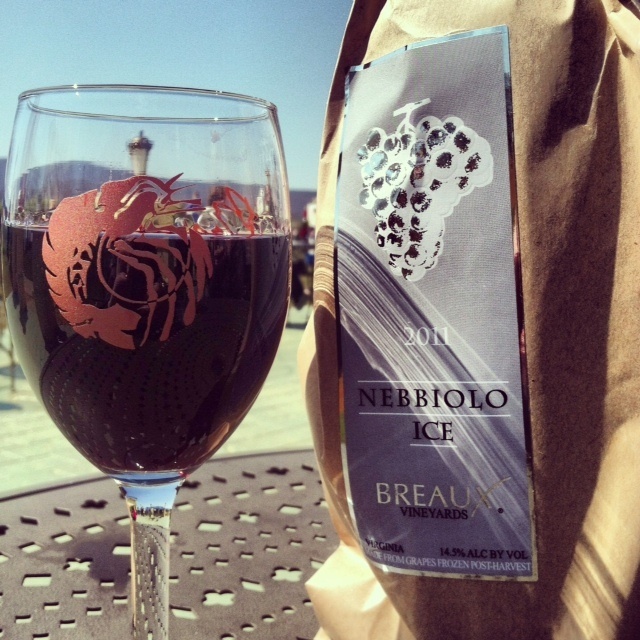 This winery should be a stop on your next visit of Northern Virginia wine country. All in all, it was a lovely day of wine tasting and enjoying the incredibly beautiful countryside that we have here in Virginia. How lucky are Virginians? My answer: some of the luckiest people in the country…I’ll stop there until after my visit to Italy next month.